Save the date for the 2019 June Fete Fair! June 1, 2019 from 8:30 a.m. – 1 p.m.
June 6, 2019  from 6:30 – 9:30 p.m.
June 7, 2019 from 4 – 11 p.m.
June 8, 2019 from 11 a.m. – 10 p.m.
June 9, 2019  from Noon – 6 p.m. If you would like to participate in the fair, contact Kris Rey at 215-481-2508 or Kristin.Rey@jefferson.edu. 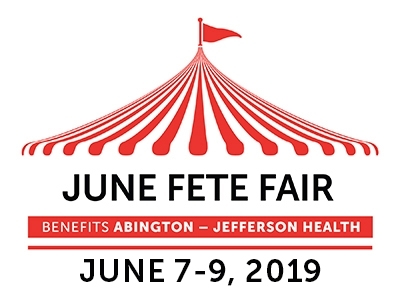 The June Fete is a registered trademark of the Abington Health Foundation (AHF) Women’s Board and is the broad term representing all its annual fundraising to benefit Abington - Jefferson Health, an expanding regional health organization serving Bucks, Montgomery and Philadelphia counties. This umbrella of fundraising includes the Women’s Board annual Special Events, Auxiliary scholarship fundraising, the Gala Program Book, vendor contracts, and concludes each year with our trademark event, The June Fete Fair. 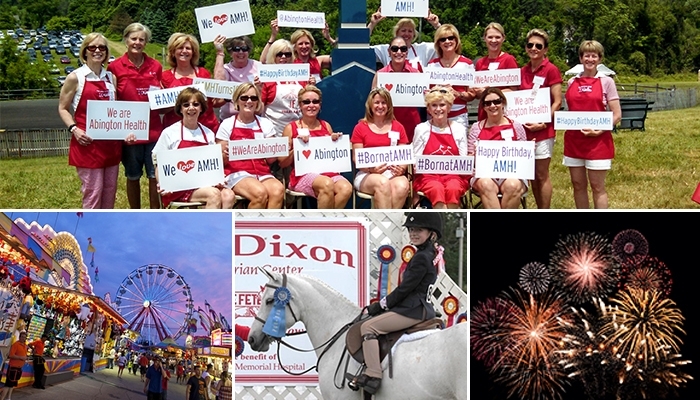 The AHF Women’s Board is a non-profit organization of volunteers in support of Abington Hospital. All our proceeds benefit services and programs to meet community and patient needs at Abington and Lansdale Hospitals by supporting medical education, community programs, building expansions, equipment purchases, and assisting patients with special needs.